YOU KNOW YOU ARE HAVING A BAD DAY when you see this team. 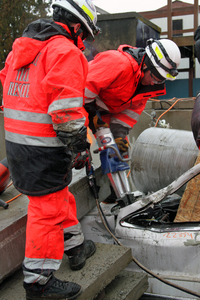 These East Pierce firefighters who belong to the Technical Rescue Team respond to extraordinary or highly dangerous rescue situations such as building collapses, confined-space entrapments, wilderness and high-angle rescues. They've become proficient responding to numerous emergencies in isolated locations. Before team members can respond to a call, they must complete several hundred hours of demanding training, demonstrating proficiency in specialties such as trench rescue, confined space, rope rescue and complicated motor vehicle extrications. This training is in addition to all of the firefighting and emergency medical training they receive as firefighters, emergency medical technicians and paramedics. But for someone who has driven off a cliff, is trapped in a trench at a construction site or is seriously injured far from civilization, this team may be the only one you want to see. The East Pierce team are members of the Pierce County Technical Rescue Team. They train with technical rescue personnel from Central Pierce Fire & Rescue, Gig Harbor Fire & Medic One and West Pierce Fire & Rescue. Together they form a regional response throughout Pierce County. The East Pierce Technical Rescue Team is led by Captain/Paramedic Kevin Stabenfeldt with assistance from Firefighter/Paramedic Jeff Palensky and Firefighter Kevin Rademacher.